Rustic chic! 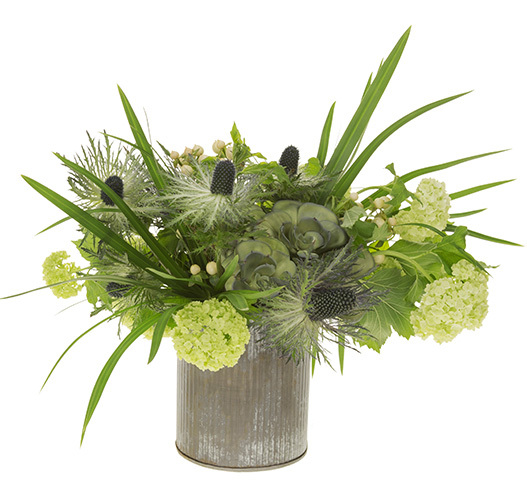 Succulents are the focal point in a monochromatic design of non-traditional grasses and flowers clustered together in a weathered zinc container. Approximate size: 11” h x 13” w.
*Viburnum Shown is available seasonally (usually March through April). Viburnum will be substituted with green hydrangea or green ball dianthus at other times . For delivery within the Portland /Vancouver metro area For delivery outside of our delivery area please call for pricing and availability. For that last minute need, special request, custom design, or if you just prefer that human touch, call us at 1-800-875-9193 or (503) 222-9193.